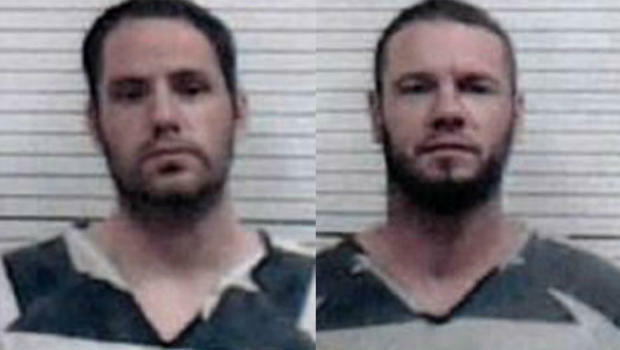 FAIRVIEW, Okla. -- Authorities in northwestern Oklahoma are searching for two inmates who escaped from jail after stealing a transport van that was driven by Inmate Services Corporation. Authorities say the inmates may be armed. CBS affiliate KOTV-TV reports Andrew Jason Foy and Darren Weld overtook two transport officers around 3:30 a.m. Tuesday. They took the van on U.S. 412 north of Fairview, which is about 80 miles northwest of Oklahoma City. Authorities say the two were being taken by an inmate transport company to a correctional facility in Kansas. The van was en route to Oklahoma, Colorado, Wyoming and Kansas to pick up inmates, according to KOTV-TV. Detectives said the stolen van is a white 2017 Ford 15 passenger vehicle with a Tennessee license plate that reads: "38366H2." Foy is a Caucasian man who weighs 210 pounds, has blue eyes, a medium build and stands 6-feet tall. He has a tattoo arm band on his upper right arm. KOTV-TV reports his final destination was supposed to be the Laramie County Sheriff's Department in Wyoming. Walp is a 37-year-old Caucasian man who has a medium build. He was supposed to be dropped off at the Seward County Sheriff's Department in Kansas. It was not immediately clear where the inmates were from or what crimes they were convicted of committing.